Photograph depicts "Skeena Prince." The iron chute projecting from the land beyond the steam of a coaster belongs to a long defunct coal mine which ran back horizontally into the hill side. 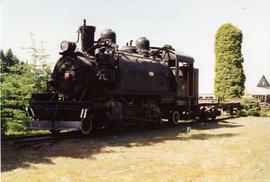 Photograph depicts a Canfor Logging Railway public passenger train on display at Beaver Cove. 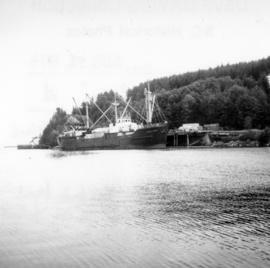 It was built in 1923 and had always been a logging liner, first in the USA. It was purchased by Canfor (Englewood) in 1947 and retired around 1960. 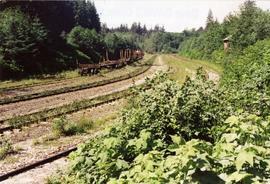 Photograph depicts the Canfor Logging Railway yard in Beaver Cove. Visible are log cars waiting to be unloaded. 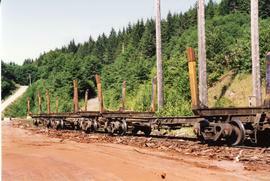 Photograph depicts the Canfor Logging Railway yard in Beaver Cove, located adjacent to a salt water dump. Visible is a railway terminal. 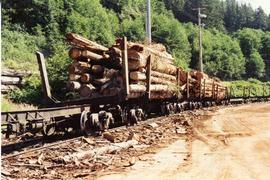 Photograph depicts the Canfor Logging Railway yard in Beaver Cove, located adjacent to a salt water dump. Visible is a railway terminal. There was one running track and 4 storage lines.